KIEV, Ukraine -- Maidan square in the heart of Kiev is Ukraine’s most famous meeting place. Countless Kiyani and visitors to their city come here to stroll, have a coffee or a cocktail and eat in the bars and restaurants that dot the streets around the square. A girl jumps over flowers near a decorative Eurovision song contest logo on Maidan square in Kiev on Tuesday. Ukrainians also occasionally gather here to start a revolution, and twice since 2004 this has been the epicentre of historic pro-democracy protests. Now Maidan and Kiev await more than 20,000 visitors for Eurovision, and a chance for Ukraine to show not only its beauty and hospitality, but how it is overcoming huge obstacles to transform itself and move closer to the West. Fan zones are springing up around Kiev, and rehearsals for the May 9th-13th song contest are in full swing on a spectacular, high-tech stage. The road running through Maidan has already been taken over by the Eurovision village, where DJs will perform and big screens will broadcast the contest. Organisers have a budget of some €27 million but Kiev needs no adornment in springtime, as pink and white cherry blossom and flowering chestnuts banish memories of the long winter, and sunshine bathes a skyline of golden domes and bell towers beside the Dnieper river. 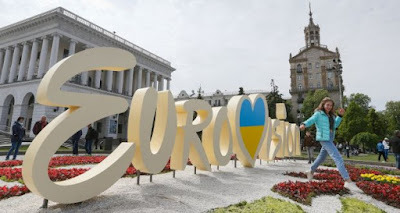 Ukraine hopes the venue and host city will dazzle visitors, more than 200 million expected television viewers worldwide and millions more watching online, but one neighbour has cast a shadow over the contest: Russia. Eurovision has been caught up in a multifaceted conflict between Ukraine and Russia, which erupted in February 2014 when pro-Moscow president Viktor Yanukovich fled protests on Maidan and sought the Kremlin’s protection, after his security forces had shot dead scores of demonstrators on the square. Russia proceeded to annex the Black Sea peninsula of Crimea and foment a separatist uprising in eastern Ukraine that has rumbled on for three years, killing 10,000 people, displacing some 1.5 million and ravaging the Ukrainian economy. Several Russian politicians and media were outraged by Ukraine’s victory in last year’s Eurovision, with a song by Crimean Tatar performer Jamala that was inspired by the Soviet deportation of her relatives to central Asia in 1944, and chimed strongly with her people’s fierce opposition to Kremlin rule today. Prominent figures in Russia called for a boycott of this year’s contest, but instead it selected as its contender Yulia Samoilova, who is confined to a wheelchair and performed in Crimea after its illegal annexation by Moscow. By going to Crimea directly from Russia rather than via Kiev-controlled territory she broke Ukrainian law and was barred from the country – prompting Russian complaints of discrimination and cruelty towards the disabled singer. To most Ukrainians, who have weathered a three-year Russian propaganda onslaught, the dispute was clearly another Kremlin bid to discredit them in western eyes, but the European Broadcasting Union that runs Eurovision angrily pressed Ukraine to drop the ban and threatened its future participation in the contest. Kiev stuck to its position, and urged Russia to send a different entrant or have Samoilova perform via video link – solutions that Moscow rejected. “We totally agree with the state’s position,” said Volodymyr Ostapchuk, one of the three hosts of Eurovision 2017. “But they will – online!” added co-host Timur Miroshnychenko. “Vova” and “Tim” said that with fellow presenter Oleksandr (“Alex”) Skichko they were honing their lines for the big night – in impeccable English – with scriptwriters who had worked with British comedian James Corden. “There’s lots of pressure. It’s nerve-wracking, but we just have to cope with it,” Ostapchuk said. Some have criticised the choice of three male hosts, but they insist Kiev’s Eurovision slogan – “Celebrate diversity” – will be reflected in a show featuring performances by Jamala and the 2004 contest winner Ruslana, and female-fronted electro-folk band Onuka. Organisers say their prime concern is security, and 16,000 members of Ukraine’s police, armed forces and emergency services will be on duty in Kiev. “It’s very important to show the world we are peaceful nation and can organise this show even during a hybrid war against us,” said Kiev’s deputy mayor Oleksiy Reznikov. “We are Europeans, but we need to wake up from the Soviet system and live with European standards in everything,” he added. Eurovision partygoers will not have to look far for reminders of Ukraine’s pain: memorials to the “Heavenly Hundred” murdered on Maidan line an adjacent street named in their honour; photographs of servicemen killed in the east cover a wall of the stunning St Michael’s Cathedral; and the Kiev Art Fort project sits beside the city’s main military hospital, and recuperating soldiers will visit the exhibition. As Ukraine’s liberal reformers continue to grapple with a corrupt old guard and a small but noisy far-right movement, one prominent Eurovision landmark has become a symbol of the country’s “unfinished” revolution. In a bold gesture, Kiev decided to redecorate a towering communist-era monument to the union of Russia and Ukraine and rename it the “Arch of Diversity”. Ultra-nationalists enraged by this “gay propaganda” forced a halt to the rainbow makeover, however, leaving the arch as an odd patchwork of colour and grey steel. “We have a picture of how we want Ukraine to be,” said Mustafa Nayem, a journalist turned politician whose call on Facebook for protesters to meet on Maidan in November 2013 helped spark the “Revolution of Dignity”. “Our transition to that point will be painful, with arguments, controversy and frustration. But that’s okay. The result is a discussion about things we never talked about before,” he added.